Heading for the project called “drop in the ocean” in Uganda, I drove randomly past Danny’s home and stopped to say hello to him. Outside in very cold wind, wearing only a dirty T-shirt, he sat half naked on the hard sand floor. This sad sight prompted me to act spontaneously. It cost me some amount of time and perseverance to find an appropriate school for Danny because attention is given exclusively to “healthy” children. Finally, I found and went to the school I think is good for him. The team of teachers told me, however, that they could only take new students next year. Danny’s situation was so uncomfortable that I said to myself, “here you must not give up; you have to fight for a place.” After 4 meetings, the school management decided to take Danny. Danny had to come along to one of these meetings to get familiar with the school. Within 3 days the school’s requested shopping spree, from the bed to the toothbrush, was done. My assistant informed the family the day before Danny was collected. In the company of his aunt, we brought Danny to the Uganda Kampala Spastic Society School for the physically handicapped. Danny now lives in a completely new world. Imagine: a jungle child comes at 12 years old to the civilized world. Of course it is hard work for his coaches and his peers, but all are confident and say “it takes a lot of patience, but we will do it.” It is also a challenge for Danny to integrate, as he indeed was an “outcast”. Despite the effort, he feels happy, says thanks you and is always bright-eyed about the good life that he may lead from now on. 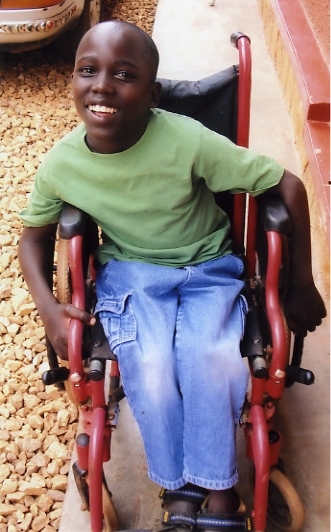 Danny urgently needs his own wheelchair which costs appx. 1000 – sfr.